GUEST STARS: Baxter Stockman, O.M.N.S.S. After the batteries died in the alien crystal converger, Donatello, using spare circuits from the space ship, builds a tracking device to help locate the second fragment of the Eye of Zarnov. On the streets, the tracking device picks up the signal and leads the TMNT to a branch of a bank where a hold-up has just occurred. The Turtles thwart the would-be bank robbers, while Shredder and Baxter Stockman, who had followed the Turtles, locate the second fragment and return to Shredder’s secret hideout. Shredder immediately contacts Krang and tells him of his recent acquisition and of his belief that if he were to hook up the second fragment to a computer, it will give them unlimited power. Krang is doubtful of Shredder’s ability to succeed. Meanwhile, the tracking device is malfunctioning and wants to short-circuit the Turtle Van, so the TMNT contact April and ask her to meet them at a nearby construction site. The TMNT figure that the ace reporter will know about anything weird going on in the city that might lead them to Shredder. Meanwhile, Shredder breaks into a Hi-Tech Lab and hooks the second fragment up to a computer mainframe called: O.M.N.S.S. – OMNIPOTENT MULT-PROCESS NEXUS SUBUNIVERSAL SENTIENT – a computer with artificial intelligence. O.M.N.S.S. proves its worth by tracking down the Turtles and sending energy through telephone/electrical wires across the city and down to the construction site. The energy activates nearby construction vehicles that go into attack mode against the Turtles and April. 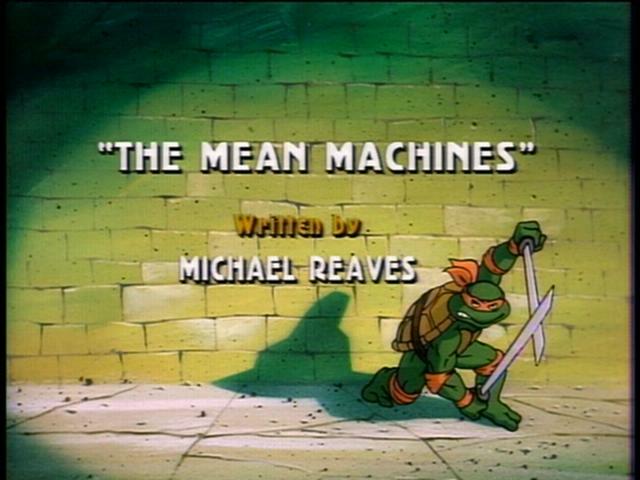 Using their wits, the Turtles are able to turn the machines against each other and escape certain death. O.M.N.S.S. declares that it needs more power and begins to drain the city power plants of their energy. Soon, machines everywhere are going berserk. The city is in total chaos. Shredder is pleased with the results, knowing that the Turtles will find him eventually and then he can destroy them. The TMNT discover Shredder’s location and as they head there, O.M.N.S.S. takes control of their van, sending them on a collision course with death! At the same time, Donatello retrieves the tracking device in hopes that it will short circuit the van. Fortunately Donny is right again and it does. Meanwhile, Shredder encourages O.M.N.S.S. to develop even more power so that he can open a portal to Dimension X and summon his Foot Soldiers. Before that can happen, the Turtles storm the Hi-Tech lab and with April’s help, O.M.N.S.S. goes offline. Once again, Shredder is defeated but he and Baxter manage to escape.